“Emerging Technologies: Exploring the European and US players in online food ordering and on-demand music streaming services” explores the key players in two fast-growing industries by using Visible Alpha Insights, an investment research technology platform that provides instant access to deep forecast data and unique analytics on thousands of companies. 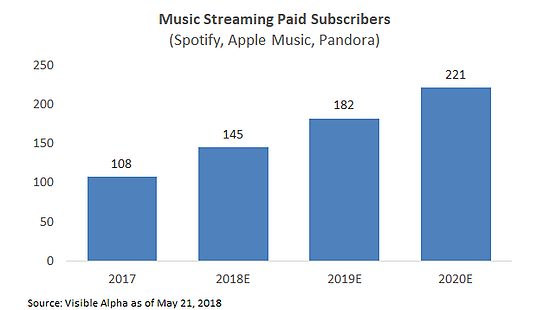 In the music streaming world, a global battle is taking place between Apple, Spotify and Pandora, so we took a dive into streaming revenue, paid subscribers and profitability to see how the competition may play out. Before we take a look, note that Apple does not report Apple Music statistics, but analysts are forecasting estimates on the size of the business. The data used in this presentation was from May 16, 2018. Streaming revenue is expected to grow rapidly for this industry. Looking into the drivers behind the growth, revenue is expected to come primarily from growth in paid subscribers (which is more than doubling by 2020), as Average Revenue per User (ARPU) is expected to remain flat. In comparing paid subscribers by company, we see that Spotify is expected to grow the most, with a paid subscriber estimate of 154 million by 2020. Apple and Pandora are both expected to remain far behind Spotify with 60 million and 8 million users in 2020, respectively. Similar conclusions are found when looking at user engagement. 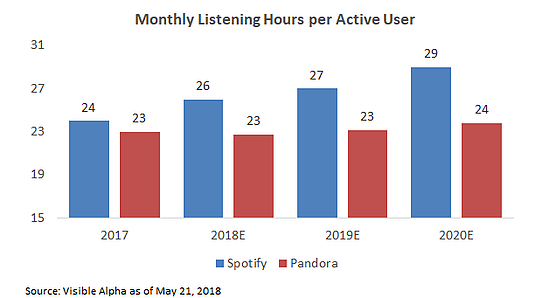 Spotify’s monthly average listening hours per user is expected to grow, while the expectation for Pandora’s users remains fairly flat. 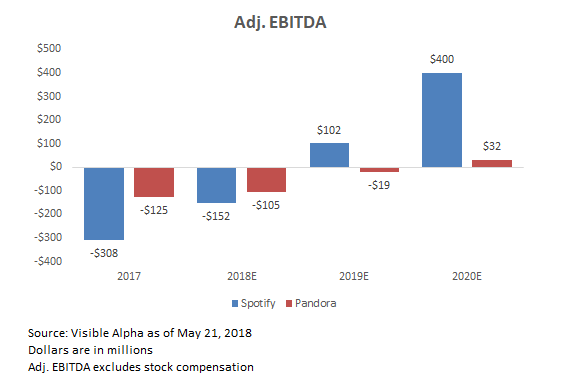 While both Spotify and Pandora are not profitable now, both are expected to turn profitable by 2020. Given its growth in paid subscriber count and user engagement, Spotify is expected to generate a significant profit of $400 million in adj. EBITDA. For online food ordering companies, we explored analyst estimates and revision history for Takeaway.com, Just Eat, GrubHub and Delivery Hero. We took a deep dive into analyst expectations in this Forbes article. Through relationships with more than 65 sell-side firms, Visible Alpha receives full analyst models and applies machine learning to create unique consensus data and analytics across every line item within the model. This allows our clients to streamline their data aggregation process and uncover new insights on the companies important to them in record speed. 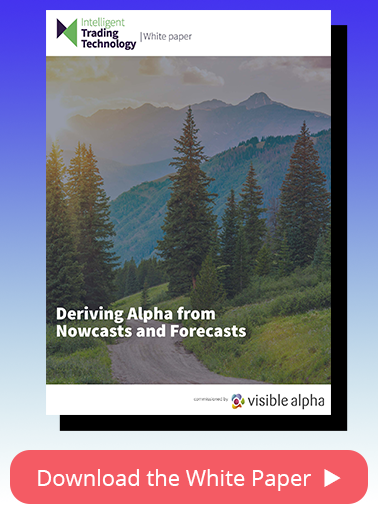 Learn more about Visible Alpha Insights. Content related to the investment research landscape. © 2018 Visible Alpha, LLC. All rights reserved.